On January 16th, 2010, Alabama head football coach Nick Saban made a promise to the Crimson Tide faithful. Coming off the heels of the Tide’s first national championship in nearly twenty years, a 37-21 win over the University of Texas Longhorns, Saban proclaimed that “this is not the end, this is the beginning.” This was music to the ears of ‘Bama fans, who felt — and still feel — entitled to gridiron glory given the program’s illustrious history and vaunted position in college football lore. Saban’s insistence that “this is not the end” suggested to Crimson Tide fans that he was committed to the school and had his eyes set on repeated success. It emphasized that he, like Bear, viewed winning not as the end but a way of life. After their recent win over Clemson, Alabama now claims 16 national championships, and their 11 is the most in the poll era (since 1936). Last week’s thrilling 45-40 victory over Clemson reaffirmed that Saban’s dynasty is alive and well after many pundits had declared it dead. Saban won his fifth title and those same pundits began to wonder whether he had done what seemed unthinkable to Alabama fans, and passed Paul W. “Bear” Bryant as the greatest coach in college football history. In this post I want to trace the rise of Nick Saban, which coincides with my time as an Alabama student, and consider his accomplishments alongside those of Bear Bryant. Nick Saban came to Alabama in 2007 after twenty-five years of “wandering in the desert.” That the Crimson Tide won three SEC titles and one national championship during those “lost” years speaks to the expectations of the program. Given Saban’s previous successes and pedigree in the SEC and the NFL, Alabama fans were expectant. An astonishing 92,000 fans filled Bryant-Denny Stadium for 2007’s A-Day, Alabama’s spring game, to “welcome their savior.” Following a rough 7-6 campaign in 2007, the 2008 (12-2) Alabama Crimson Tide announced that they had arrived with an undefeated regular season. The 2009 (14-0) team turned 2008’s disappointing SEC Championship and Sugar Bowl losses to Florida and Utah into Alabama’s first national championship since 1992. The next season opened with much promise, but Alabama fell short of its goals to finish 10-3 in 2010. One of those 3 losses was to hated Auburn, who won 28-27, despite the Crimson Tide leading 24-0 at one point. While the loss to Auburn was devastating, it galvanized Alabama and served as motivation for the coming seasons. The 49-7 destruction of, Big Ten co-Champion, Michigan State in the Capitol One Bowl served as notice that this was not the end. A view of the University of Alabama campus. Photo by Edward J. Gray. The story of the 2011 edition of the Alabama Crimson Tide doesn’t begin with their 48-7 season opening win over Kent State. It begins on April 27th, 2011 when an EF4 Tornado ripped through the city of Tuscaloosa, leaving forty-three dead. As a student on campus, I was struck by the way in which the community rallied together in the aftermath of the disaster. Nick Saban was at the forefront of community efforts to rebuild, often visiting shelters and raising money. On the gridiron, the Crimson Tide also boosted morale. That season, a houndstooth ribbon adorned the 25-yard lines at Bryant-Denny Stadium, serving as a reminder of what was lost and what still stood. The disaster inspired the team to win for the residents of Tuscaloosa, making their 8-0 start particularly gratifying. That same desire made the Tide’s 9-6 overtime loss to LSU on November 5th, 2011 in Tuscaloosa devastating. After the defeat, which seemingly knocked Alabama out of the title hunt, I voiced to a friend my concern that Saban’s promise regarding ends and beginnings may not be as prophetic as the Tide faithful had hoped. I had my doubts. As it would turn out, however, Saban wasn’t just whistling Dixie. In the following weeks, Alabama got the necessary help to rebound in the polls. Nationwide, teams seemed to trip over themselves, allowing Alabama to rise to #2 in the country. The Iron Bowl that year served a dual purpose: Alabama avenged the previous year’s loss and simultaneously booked their ticket for a rematch against LSU in the national title game. The Crimson Tide got revenge over LSU in a dominating 21-0 victory, securing its 14th National Title and winning one for the city of Tuscaloosa. Many remember the 2011 season in terms of the nationwide disgust in the rematch that led to the current College Football Playoff system, but for me and other Alabama fans, it was about coming together as a community and picking up the pieces after April 27th. Of the four championships I’ve experienced as an Alabama student and alumnus, 2011 remains by far my favorite for this reason. The 2012 season followed a similar script to the 2011 season: Dominating wins, punctured by a devastating loss (this time to Johnny Manziel’s Texas A&M Aggies), followed by providence (again) as teams nationwide fell, positioning Alabama for another title run. After an exciting 32-28 victory over Georgia in the SEC Championship, Alabama was matched up with the undefeated Notre Dame Fighting Irish in the BCS Championship Game. Billed as a titanic clash of traditional powerhouses, Alabama dominated from start to finish in a 42-14 victory. The front-page Tuscaloosa News from the day after simply read “Dynasty.” It served as evidence that Saban had fulfilled his promise. He returned Alabama not only to the glory land of national championships, but the heady heights of Bear Bryant. Joining this statement, in the weeks before the 2013 season, was a new chalk painting at Druid City Brewing Company, a local craft brewery in Tuscaloosa. In a parody of Michelangelo’s Creation of Adam, the painting featured Bear Bryant (playing the role of God, naturally) handing a championship trophy to Nick Saban. Druid City co-owner Bo Hicks explained that artist Rich Marck’s piece was a fun joke because “so many people revere Coach Bryant, and definitely today Coach Saban, we thought it was a funny way to portray them.” After all, as former University of Georgia coach Wally Butts used to say, “the definition of an atheist in Alabama is a person who doesn’t believe in Bear Bryant.” This was not the end. The 2013 (11-2) and 2014 (12-2) seasons, represented another parallel between Saban and Bryant. In the late-1960s, Bryant faced a downturn in fortunes and the Crimson Tide stopped competing for national titles. In 1971, however, Bryant implemented a wishbone offense after consulting with Texas coach Darrell K. Royal. Saban faced a similar challenge, as the evolution of spread and HUNH (hurry up, no huddle) offenses pushed his stout defenses to their limits. Saban recognized that he could no longer rely on pure strength up front, and began to recruit speedier defensive linemen and linebackers. At the same time, he began to experiment with spread concepts in Alabama’s offense. The 2015 season represents the payoff for these efforts. The defensive line, hailed by some as one of the best in the history of the sport, was quick and lethal. While Heisman Trophy-winner Derrick Henry carried Alabama’s offense, Saban and offensive coordinator Lane Kiffin sprinkled in spread concepts, such as run-pass options, to great effect. In addition, more than any other team in the Saban era, the 2015 Crimson Tide bought into the coach’s philosophy of “the Process,” though this was not clear from the season’s outset. It would take a loss to jumpstart the Crimson Tide. When Alabama lost to the University of Mississippi 43-37 in September, after a backbreaking five turnovers, many declared the dynasty was at an end. Sports commentators remarked that Saban could not solve a competently executed modern spread offense, citing losses to teams such as Auburn, Ohio State, and Ole Miss. Pundits suggested that the Crimson Tide would continue to be good, but never again great. The loss was a turning point in the season. It motivated Saban and the Alabama players to prove their doubters wrong. This was not the end. Pregrame of LSU vs. Alabama at Bryant-Denny Stadium, Nov. 7, 2015. Photo by Edward J. Gray. Two weeks later, heading into a key matchup at undefeated Georgia, Alabama found itself an underdog for the first time since 2008. The reenergized Crimson Tide rolled 38-10, emphatically announcing that they weren’t dead yet. The team kept winning, earning Derrick Henry the Heisman Trophy and Alabama the SEC Championship. In the semi-finals of the college football playoff, Michigan State again found themselves facing a determined Alabama squad, and were ruthlessly dispatched 38-0. The National Championship Game, against dual-threat Heisman finalist Deshaun Watson and the Clemson Tiger, represented the final test for the phoenix-like Crimson Tide. Clemson and Watson gave Alabama everything they had, but it was not enough as Alabama eked out a 45-40 victory. In a twist of fate, the victory was Saban’s 100th as coach of the Crimson Tide. Bryant also tallied his 100th victory against Clemson in 1969. Nick Saban and Alabama were not dead, buried, or gone. The loss to Ole Miss was not the end, it was the beginning of the next chapter in Saban’s Alabama Dynasty. Who’s best, Bryant or Saban? Context Matters. Though Saban’s five total championships (four at Alabama, one at LSU in 2003) are second only to Bryant’s six, Saban has in many ways achieved more. Saban built his dynasty in an era of much greater NCAA oversight. Today, teams are limited to 85 scholarship players and are unable to stash talent on other athletic scholarships for other sports, as Bryant was able to do. This is also perceived as an era of greater parity. Despite these limitations, Saban has accomplished things that Bryant never did in Tuscaloosa. While Bryant was 0-3-1 against the University of Texas, Saban is undefeated with his lone win coming in the aforementioned 2010 BCS National Championship Game. More significantly, in the minds of the Alabama faithful, is Saban’s record against Notre Dame. His victory in the 2013 BCS National Championship Game, where the Tide beat the previously undefeated Irish 42-14, in a game that was not as close as the score, squashed long-held anxieties and fulfilled lingering ambitions for Alabama fans. Bryant was 0-4 against the Irish, and thus the win served not only as a coronation for Saban’s new dynasty but as a cathartic release for a fanbase that resented any challenge to their historical supremacy. Another common critique of Bear and comparison with Saban, is the success of their star players. While John David Crow won the 1957 Heisman Trophy while a member of Bryant’s Texas A&M Aggies team, the Bear failed to have a player win the Heisman while at Alabama. Responding to this criticism, he famously said, “at Alabama our players do not win Heisman Trophies, our teams win national championships.” Saban is proving that it is possible to do both, having had two players win the coveted Heisman (Mark Ingram in 2009 and Derrick Henry in 2015). Despite Alabama’s illustrious football history, Ingram and Henry are the Tide’s only Heisman winners. Once again, Saban has filled another missing piece. Going off of those facts, then, it would seem that Nick Saban has indeed wrested the title of greatest college football coach from Bear Bryant and left his own mark on the Alabama program. Crimosn Tide fans cannot ask for much more than Saban in terms of on the field success. I would be remiss, however, if I did not mention the enormous cultural impact that Bryant had and continues to have on the state and University of Alabama. Bryant isn’t just revered for his 323 wins and 6 national championships, he is a cultural icon. The houndstooth pattern that Bryant wore is ubiquitous on game day, and a popular campus bar is named Houndstooth. Before every home game, a traditions montage is played and at the end fans hear Bear growl out in his characteristic drawl “I’d like for the people to remember me as being a winner, cause I ain’t never been nothing but a winner.” Even a Yankee boy from Pittsburgh, who was born almost a decade after his death, is drawn into the cult of the Bear. I proudly display a painting of Bryant and a coke bottle commemorating his 315th victory in my home. Upon his arrival, Bryant had his work cut out for him. Alabama had gone 4-24-2 during the disastrous three-year tenure of J.B. “Ears” Whitworth. There are even some Alabama fans that insist that Bryant saved the program from disappearing into football oblivion. Whether that assertion is true or not isn’t as important as the fact that current Alabama fans believe it is true. During his 25 years as head coach of the University of Alabama, Bryant won thirteen Southeastern Conference Titles and six National Titles (1961, 1964, 1965, 1973, 1978, 1979) and many Alabama fans will stubbornly insist he was robbed of another in 1966. They claim that the AP, dominated by northerners, conspired to keep all-white Alabama from a three-peat. 1966 is not the end of Bryant’s relationship with race and Alabama football, however. During his tenure, the Alabama Crimson Tide served as a source of pride for a state that felt shamed and attacked during the Civil Rights Movement. As historians Randy Roberts and Ed Krzemienski explain, “Football and race, race and football — they were what white Alabamians talked about, argued about, and commiserated about. They were what unified a state sharply divided racial, class, and educational lines.” It was a tumultuous time for the state. Alabama was ground zero for the Civil Rights Movement. In June 1963 segregationist Alabama Governor George Wallace, an alumnus of UA, famously stood in the schoolhouse door of Foster Auditorium to deny the enrollment of African-American students at the University. Only a few months later, the 16th Street Baptist Church was bombed in Birmingham. Integration seemed the only way for Alabama to return to football prominence. To hear some Alabama fans tell it, Bryant scheduled the 1970 game against the University of Southern California and their star African-American running back, Sam Cunningham, as a way to show that an all-white Alabama could not compete with integrated squads (though this interpretation has recently come under question). It worked as USC embarrassed the Tide 42-21 in Birmingham. As Lindsay Parks Pieper explained last week, Alabama fans today take pride in this mythology, celebrating Bryant’s efforts to advance race relations and integrate the Tide. By 1973 almost a third of the roster were African-Americans. 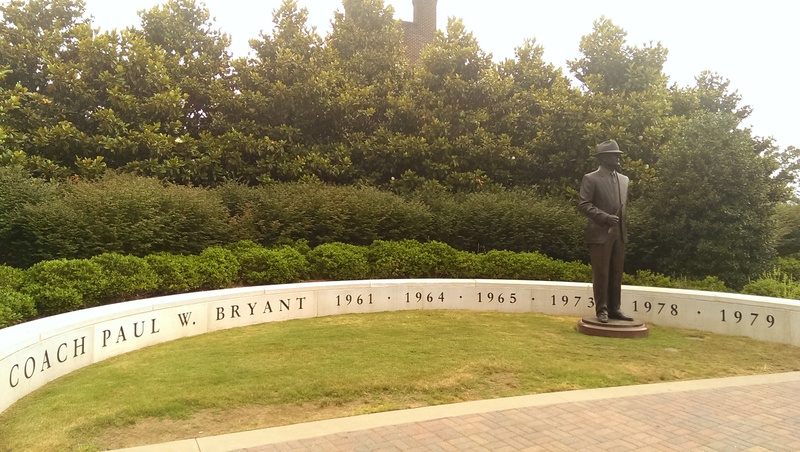 Statue of Paul W. “Bear” Bryant outside of Bryan-Denny Stadium. Photo by Edward J. Gray. Whether the integration of the team or the implementation of the wishbone offense (as some fans suggest) was responsible for Alabama’s return to national dominance, the fact remains that Alabama won three national championships and eight SEC titles during the 1970s. His legend was only further cemented when Bryant passed away less than a month after his final game, a 21-15 victory over Illinois in the 1982 Liberty Bowl. Although he jokingly predicted that he’d “probably croak in a week” after retiring, Bear was right that he couldn’t live without football. Spectators lined Interstate 20/59 for his funeral procession from Tuscaloosa to Birmingham, an estimated 250,000 thousand people came out to pay their respects to the Bear. To this day, Bryant is revered. I’ve asked a few of my friends from Alabama the question posed above: whether Saban or Bryant is the better coach. I’ve gotten different responses, and, perhaps, the most common one is the interpretation I agree with: they’re different and it is too hard to tell for sure. The eras are too different, and even if Saban keeps winning (which I suspect he will) he won’t ever have the cultural punch that the demi-god Bryant had and continues to have. There may indeed come a time when the college football world regards Saban as the better coach than Bryant; Saban’s fire has not yet burned out (remember: this is not the end). For Alabama fans, though, I suspect that Saban will always be chasing after the Bear in terms of cultural significance. Greatness, after all, is about a lot more than trophies and wins and losses. It’s a nice problem to have if you’re an Alabama fan, though. Christopher J. Walsh, Where Football in King: A History of the SEC, (New York: Taylor Trade Publishing, 2006), p. 4. Randy Roberts and Ed Krzemienski, Rising Tide: Bear Bryant, Joe Namath, and Dixie’s Last Quarter, (New York: Twelve, 2013), p. 20.
,Kurt Edward Kemper, College Football and American Culture in the Cold War Era., (Urbana: University of Illinois Press, 2009), p. 199. Allen Barra The Last Coach: A Life of Paul “Bear” Bryant, (New York: W.W. Norton & Company, 2005). At the age of 64 Nick Saban has been at Alabama for nine seasons whereas Paul “Bear” Bryant had been at Alabama for 25 seasons by the time he was 69. There is no doubt that Saban is the greatest coach of present college football, however he has not caught Bear yet. How much longer do you think he can keep this dynasty going? Do you think he will coach until he dies as Bear did? If that’s the case how long does he have? Without a doubt he can go beyond 69, but how much longer? How long is it until he’d rather sit in the crowd and enjoy the game? I know most of these questions are unanswerable, but what is your opinion. The times are different and the game has evolved throughout the years. Bear brought the culture, but Saban has changed the college game to the fast paced game fans have come to know and love. Both of theses coaches have brought different things and they are both dynasties of different times. You can compare them, but never equally by numbers, there are so man y different things that have to be accounted for. Thanks for reading the piece! I agree with you, they’re just too different to compare. I’d take Saban in a one on one matchup for all the marbles, but he won’t be on the same level as Bear anytime soon. Saban (fortunately for Tide fans) isn’t done yet, and while I don’t think he’ll make it another 16 seasons to match Bear, I am equally sure that he won’t retire soon. I think a lot of his longevity will depend on how long Saban thinks he can keep up with the rigors of coaching. The man is devoted to excellence, and when he does walk away, I can totally see it being after he decides he can no longer lead the Crimson Tide to the standard that he has set. When asked to reflect on his legacy after winning his fifth championship, and whether he’d retire soon, Saban said that he had been a part of a team since he was a kid, and the thought of NOT being on a team frightened him. So in that respect, I can totally see him coaching until he can’t physically do it any longer. I didn’t get to go into this in as much detail as I would have liked, but I truly believe that Saban experienced a change in personality/outlook after the tornado in April 2011. After that date, Saban seemed to really step back and appreciate the players, the University, and the fans. I’d even go so far as to argue that his number one mission in life has been to serve as a mentor for the players. If you’re interested in this side of Saban, I’d really encourage you to take a look at Lars Anderson’s “The Storm and the Tide.” It’s a chronicle of the 2011 season, from the April tornado to the 2012 BCS National Championship Game win over LSU. It’s one of my favorite books about the Crimson Tide, in part because I was able to experience the tragedy that spring and the ensuing triumph on the field as a student.